Genre: Role Playing Game Publisher: Square Enix Inc.
Release Date: 2019/1/29 Developer: Square Enix Inc.
Embark on an adventure that spans the Disney universe: Travel across Disney and Pixar worlds to protect them from the Heartless invasion, and befriend and join heroes from Toy Story, Monsters, Inc., Big Hero 6, Tangled, Hercules, and more! The mysterious and powerful Keyblades can now transform into additional forms with new abilities, moves, and animations. Equip multiple Keyblades and combo between them to unlock spectacular attacks! Cast visually stunning, powerful magic spells to battle the Heartless. Call upon Disney-Pixar friends and partner with them for support. Turn the tide of combat by summoning all-new “Attractions” inspired by the theme parks. Explore and interact directly with the Disney-Pixar worlds. Fight off swarms of Heartless while scaling massive cliffs, diving deep underwater, or even freefalling through the air. Experience unique gameplay elements custom designed for each new world! Take a break from saving the world with over 20 minigames inspired by classic Disney short films. 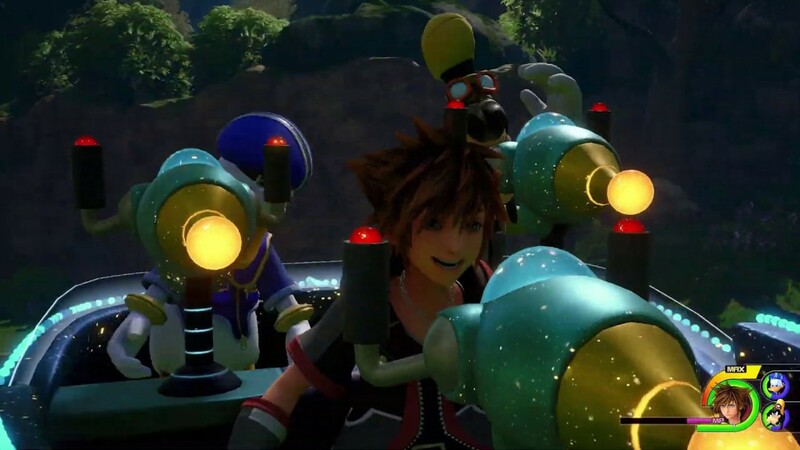 © Disney © Disney/Pixar Developed by SQUARE ENIX. SQUARE ENIX and the SQUARE ENIX logo are registered trademarks or trademarks of Square Enix Holdings Co., Ltd.